Are you looking for a sweet, goofy, gentle giant? A dog who is playful, but past the puppy stage? Rocco is your guy! He is a 6 year old American Bulldog-Cattle dog mix. At 83 pounds he’s a big boy, but he’s totally unaware of his size and wants to be a lap dog. He loves getting excited during play time, but that’s about the only time he gets riled up. He really just prefers laying around the house and cuddling with his people. He has been through the beginner classes at PetSmart. He was top of his class and now knows his basic commands: sit, lay down, stay, watch me, leave it, shake, and loose leash walking. He took to the training very quickly and was learning very fast. He has a lot of potential to someone wanting continue training him. The only thing we could not train was living with cats. Rocco cannot live in a house with cat siblings. He is, however, great with other dogs. He has lived with another mellow dog, and they get along great. 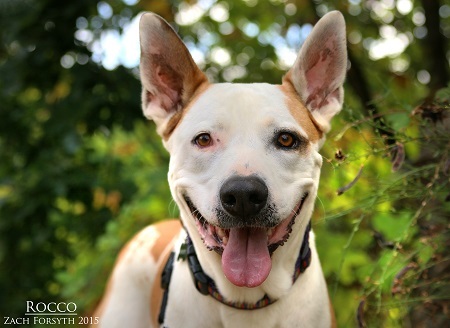 Rocco has been socialized around other dogs, and has been great in most settings. He also likes being around people, large backyard gatherings do not seem to bother him. Can you provide a comfy couch and a loving heart for this sweet boy? Fill out the adoption application so we can schedule a meet and greet. He is fixed, vaccinated and microchipped. Adoption fee is $250. Rocco is currently in foster care.